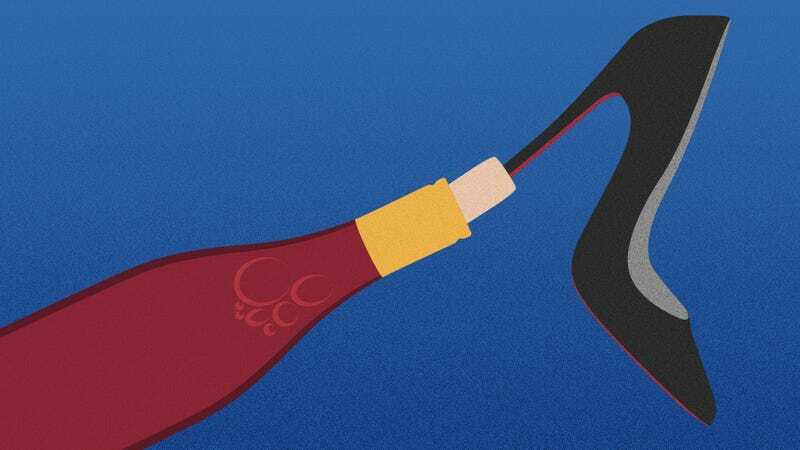 Can you MacGyver a wine bottle open with a shoe? Picture: A perfect summer day. You’ve prepared a picnic for the beach or park or outdoor movie or concert with a crusty baguette, artisanal cheeses, farmers’ market stone fruit. To top it all off, a lovely pinot. But when you arrive at your destination, you discover that you left your corkscrew at home, and this bottle is not a twist-off. Short of smashing the bottle neck against a tree and drinking around the jagged edges, what can you do? I’ve always heard about people being able to open wine bottles with shoes, but fortunately haven’t had to try out such a process on my own. I pride myself on being able to open any bottle of wine with one of those pocket, 79-cent corkscrews. Broken cork? No problem! I will not rest until my goal (wine) is achieved! Still, what if our junk drawer finally ran out of its seemingly unlimited supply of cheap corkscrews? Just the horrific thought was enough for me to realize that opening a bottle of wine with a shoe might be a valuable life skill, like being able to do your own taxes. But as I am a decidedly unhandy person, I enlisted the handiest person I know to help: my husband. In this instance, let’s call him MacGyver. He’s a union electrician, so is one of those people who always has a box cutter or a small flashlight on hand (now that we’re old, this makes us very popular at dimly lit restaurants when he pulls out his light to read the 7-point type on the menu). When we went to the courthouse to get our marriage license, he had to empty his pockets of so much metal at the metal detectors, I’m surprised they actually let us in the door. Suffice it to say, if MacGyver can’t easily open a wine bottle with a shoe, I sincerely doubt it would be easy for anyone. This is a man who can hang a ceiling fan—right out of the box. We found that a shoe with too much cushion, like his work boot, did not work as well as just a plain old Oxford, placing the wine bottle in it to stand up just like a leg. Then you turn it on its side, holding the wine bottle with your right hand and the shoe with your left, smacking the heel against the hardest surface possible, like a brick wall if you have one handy (hopefully the tree at your picnic is sturdy). Even then, we really had to hack the hell out of it, making some progress, but not enough to suit him. MacGyver being MacGyver, he soon augmented the wine-opening with another tool from his considerable arsenal: a lighter. He reasoned that applying heat to the neck of the bottle would help separate the cork from the glass, and there was definitely an audible pop. That got us to about halfway out, with a few more Hulk- or Thor-worthy whacks to get us to that elusive finish line. Important note: Do not end the opening on a whack, which could have disastrous consequences for wine you want to drink rather than have shatter into your shoe. Once the cork is close enough to wriggle it out of there, wriggle it out of there. In conclusion, don’t forget your corkscrew. But if you do forget, and you happen to have a sturdy shoe, a lighter, and a MacGyver on hand, there just might be hope for your picnic yet. How long does it take for alcohol to go bad? What’s the fastest way to chill wine?